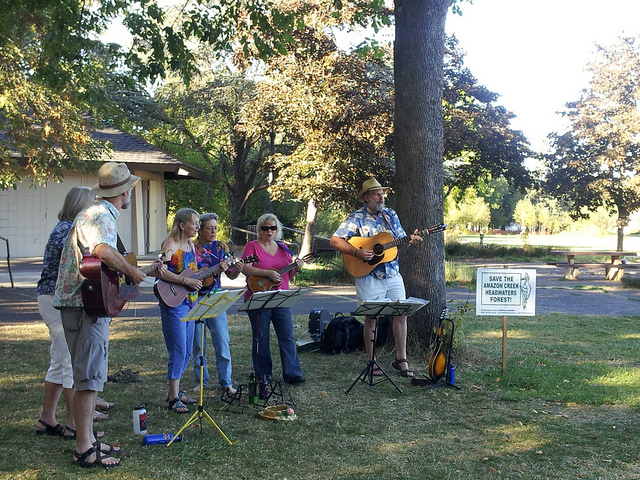 Local band “Late to Dinner” played at the 2012 Summer Picnic. Summer is a great time to meet new neighbors and connect with the community. A fun way to do it is to participate in the neighborhood picnic. Tugman Park is reserved for September 15, 2013 from 4 – 7 pm. We’ll have music, fun activities for kids, a free raffle with great prizes from local businesses, an urban garden sharing table, a gift circle, free ice cream, juggling supplies (poi, diablos and twiddle stix), and valuable information from a variety of groups working to improve the neighborhood. Plan to join us. More details to follow as we finalize the preparations. Please send in your suggestions to help us make this the best picnic yet. Email southeastneighbors@gmail.com or call us at (541) 782-8736. July 26, 2013 in Community Events. General Meeting: Input from Southeast Neighbors Needed!